Simply the best autumn colour for your garden! A classic helenium, and one of the earliest to flower, 'Sahin's Early Flowerer' will guarantee you a show-stopping display of blooms each year. Bursting from deep bronze buds, each flower is different, with varying shades of red and orange producing an endless display of burnt-orange flowers from early summer into autumn. In our opinion, an absolutely essential plant for autumn colour, blooms are held on tall, straight stems, and are perfect for cutting and bringing into your home. Easy to grow, plants are robust and fully hardy, rarely suffering from disease, so a great plant to grow if you're new to gardening or don't have the time to fuss over high maintenance divas! Supplied as an established plant in a 9cm pot, ready for potting on or planting out, heleniums will reach around 100cm high x 50cm wide. The fiery outer petals form a blazing ring around a prominent brown button which in turn gradually transitions to yellow as it ages as a wave of stamens appear. In our opinion, an absolutely essential plant for autumn colour. Held on tall, straight stems, Heleniums are perfect for cutting and bringing into your home for a splash of colour. 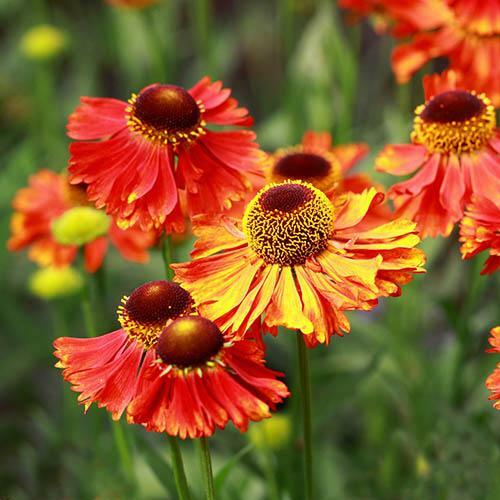 Also known as sneezeweed, heleniums are recommended by the RHS for including into planting schemes designed to attract wildlife into your garden, attracting a host of butterflies, bees and other pollinators with its nectar-rich blooms. Supplied as an established plant in a 9cm pot, ready for potting on or planting out, heleniums will reach around 100cm high x 50cm wide. Note plants are dormant October - March so may show no leaves in the pot. Deadhead regularly to prolong blooming and cut back by half when flowering has finished. Plants can be cut to the ground in autumn. As a perennial, helenium will die back to below ground level each year in autumn, before fresh new growth appears again in spring. Grow in any fertile, moist but well-drained soil in full sun. Provide support for the best results, especially in exposed areas. To keep sneezeweed happy, divide clumps every three years or so to rejuvenate them.